CONCORD, N.C. (April 18, 2017) — For more than three decades, NASCAR fans eagerly snapped up prints of famous Sam Bass paintings featuring such legends as Dale Earnhardt, Dale Jr., Jeff Gordon, Jimmie Johnson and others. Now, for the first time, they can own the original pieces of art themselves. 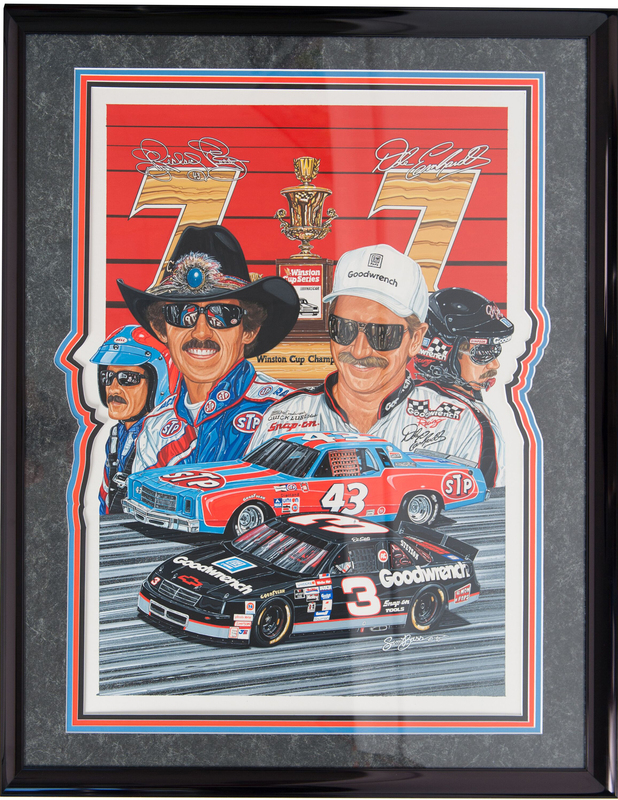 More than 250 pieces of original Sam Bass artwork, with certificates of authenticity and valued at over $1.7 million, will be sold in a bankruptcy auction Wednesday, May 3, with Iron Horse Auction Company conducting the event. “Mr. Bass was the first officially licensed artist of NASCAR and became as well known to many fans as the drivers whose faces and cars he painted. Over the years, he held back the originals of many of his best works, and now fans can actually own the original works that have never before been offered for sale,” said Iron Horse’s Tom McInnis. “These include many works of art that will be immediately familiar, and we expect they will be of interest not only to individuals, but also to museums, restaurants, bars and other businesses with sports-themed rooms,” he said. The auction was ordered by the U.S. Bankruptcy Court for the Middle District of North Carolina, Winston-Salem Division. Also selling will be 85 custom guitars, many designed by Bass. Among them is the one used as a prop for the film, “Talladega Nights.” Other items being sold include stock car hoods, panels, and other collectibles. Online pre-bidding will begin April 25 at www.ironhorseauction.com, but the items are already listed. The live auction will begin at 10 a.m. Wednesday, May 3 at the Cabarrus Arena in Concord, N.C. Individuals seeking additional information may call 910-997-2248 or visit the web site. Iron Horse Auction Company, Inc., based in Rockingham, N.C., provides comprehensive asset recovery and marketing services for corporations, non-profits, professionals and individuals.